Lukas Coaching: What are you doing to teach your kids about money? What are you doing to teach your kids about money? As our oldest, Ava, becomes older we're trying to teach her more about money. If you think your child's school or church will teach them about money, think again. I'm afraid the burden is going to fall on you as parents. Don't let them go off to college not knowing anything about money. 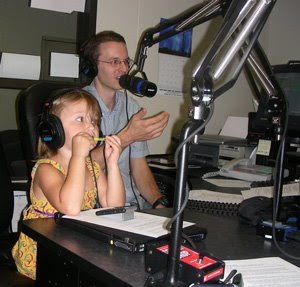 For ideas on what to teach your kids and when, listen to the Past Due Radio Show. Here's a picture of our oldest Ava in the studio with me. I brought a visual aid with me, which incidentally doesn't work well in radio.